Tandoori Style Latkes - Kosher In The Kitch! Tandoori Style Latkes - Kosher In The Kitch! Latkes, much like matzo balls, generally elicit strong opinions. While some harold “floaters” over “sinkers” in the matzo ball circles, latkes undergo at least the same amount of scrutiny when we raise the question, “shredded or solid?” While supporters of solid latkes question the authenticity of the shredded variety, citing too great a similarity to hash browns, I can very well say the same about the solid kind bearing a strong resemblance to a croquette. Which takes the goyish prize now? Truth be told, there are very marked differences between croquettes, hash browns, and latkes, and according to some prominent food historians, the latke was probably the precursor to both. In a nutshell, the theory goes that travelling Jews were responsible for much of the food innovation we’ve experienced in Biblical times; influences we experience to this day. Jews and other sojourners at the time were responsible for popularizing “foreign” food. That is to say, they were largely responsible for introducing different kinds of cuisine they experienced during their travels to other peoples they visited along the way. This exchange of cultural cuisine also influenced what we now know as Jewish/Israeli food today…although I suppose you’d never guess that if your only exposure to Jewish food is Eastern European Ashkenazi! :) These adaptations and changes occurred, of course, because of very necessary adaptations to accommodate a kosher diet, and what was available. It became advantageous to possess a large arsenal of herb and spice knowledge, as well as developing new techniques in order to create something edible and, hopefully, tasty in different terrain, climates, and landscapes. 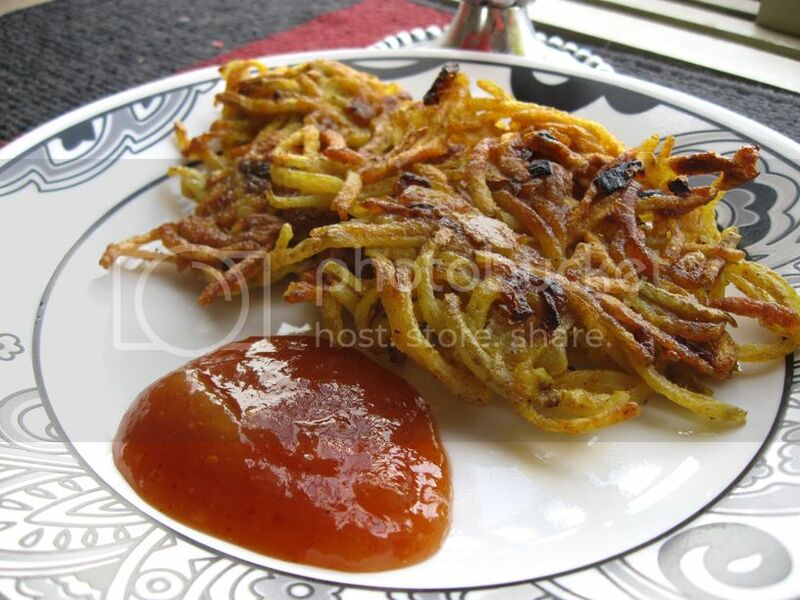 Try making some tandoori-style latkes by adding a few simple spices and ingredients! Combine ingredients and fry in hot oil. Serve hot with a side of mango chutney. Enjoy! *It’s a good idea to use sauteed onions in latkes in general. The sauteeing process not only unlocks some good oniony flavor, it also removes a lot of the water locked up inside the onions, which would otherwise lend too much moisture to your latkes, causing them not to crisp up.